The social graph is something that the digital world is struggling to understand right now. How important are the connections within your digital social circle? Who are the most important connectors in your graph? How far does influence travel online? Well, according to a study from Invoke Solutions, it’s still real world friends that hold the most sway with consumers online. And while Facebook has made a niche for itself by fostering online relationships between people who are friends or know each other offline, on Twitter there could be trust issues. Facebook. But posts on Twitter were even less trustworthy. Invoke asked frequent social media users what sources they trusted online. 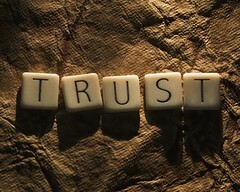 26% completely trusted blogs written by their friends. 23% trusted their friends’ Facebook posts. But only about half that (12%) completely trusted messages from friends on Twitter. Those numbers were still higher than brand messagins. Blog posts from brands scored 11% complete trust, Facebook posts from companies had 9%, and brands posting on Twitter had the complete trust of 6% of respondents. That’s to be expected. But consumers also trust posts from their friends more than professional bloggers and community members. On Twitter, independent bloggers only inspired 5% total trust. And fellow community member comments only ranked slightly higher at 8%. And more surprising still is the fact that people trust brand posts more than independent bloggers. Brand streams on Twitter inspired 6% of responses that registered complete trust, compared to 5% of bloggers on Twitter. activiley seek out messages from experts and bloggers. That seems to be the value that Twitter adds to the Facebook status messages that predated its existence. But if people don’t trust those messages, it changes the power structure of Twitter’s social graph. Especially considering that so called influencers are sought after at such a premium online, this study turns that notion on its head. It’s understandable that people would trust their real life friends more than strangers online, but when brands are more trustworthy than bloggers and community members, that seems to be a sign of incredibly strong marketing or trust issues on a platform. But then again, it probably doesn’t matter what I think about this. Unless you know me in real life. In alll the talk about paid content online, the word freemium comes up a lot. In theory, freemium allows consumers to get a taste of a product for free and then eventually converts them into paid customers once they get hooked and demand more services. But it’s not always so easy. In the case of social networking platform Ning, the freemium model was putting them out of business. Starting in June, Ning went all in on premium. The result? More people are paying to use Ning. But whether that’s sustainable is another story. All Econsultancy paid members now have access to free hot desking in central London at Lemon Studios. Lemon Studios provides co-working space for digital marketing and technology firms, small agencies, freelancers and contractors. It is based right in the heart of Clerkenwell, just around the corner from the Econsultancy HQ.